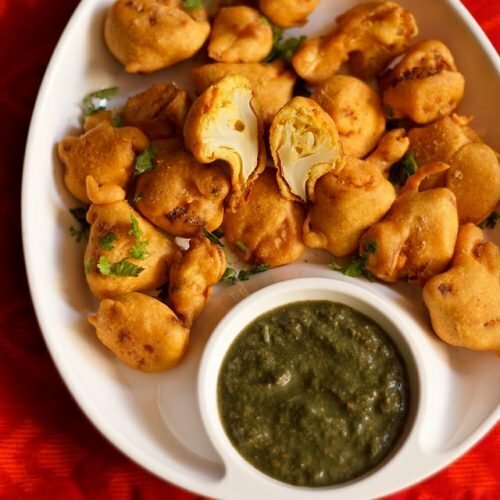 gobi pakoda recipe - crisp fried marinated cauliflower fritters made with gram flour or besan. boil enough water with salt. break or chop the cauliflower in medium sized florets. rinse them well and add them to the boiling water. switch off the flame and let the cauliflower florets be immersed in the water for 10-12 minutes. drain and then marinate the cauliflower with red chili powder, turmeric powder, ginger-garlic paste, garam masala powder. mix very well and keep aside for 8-10 minutes. in another bowl, make a smooth batter with the besan/gram flour, asafoetida, baking soda or baking powder, salt and water. next add carom seeds to the batter and mix well. heat oil in a kadai or deep fryer. take each marinated cauliflower and dip in the batter. coat each floret with the batter and add these in the medium hot oil. fry till the cauliflower fritters are crisp and golden evenly. drain cauliflower pakoras on paper towels to remove excess oil. serve the cauliflower pakoda hot or warm with any green chutney or sauce, sprinkled with chaat masala, lemon juice and chopped coriander leaves. another way to make these gobi pakoras is without marinating them. just mix everything except the cauliflower and prepare the batter. dip the gobi florets into the spiced batter and fry the gobi pakoras.